Media reported that Department of Telecom reportedly issued a notification banning 32 sites, URLS on December 17. A screenshot of the circular has been posted on Twitter by Pranesh Prakash. 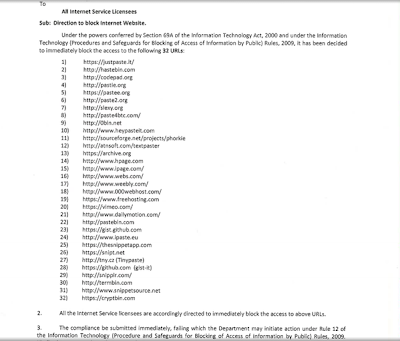 The notification mentions that 32 URLs including Pastebin, video sharing sites Vimeo and DailyMotion, have been blocked under Section 69A of the Information Technology Act, 2000. DoT has also asked ISPs to submit compliance reports. Arvind Gupta, a national head of the ruling BJP’s IT cell, said the blocks are an anti-terrorism measure and that websites complying with instructions to take down anti-India content posted by the Islamic State of Iraq and Syria are being unblocked. It is Vimeo's longstanding policy not to allow videos that promote terrorism, and we remove such videos whenever we become aware of them. As of this morning, we have not received notice from the Indian government, and have contacted them requesting the blocking order to identify, and evaluate any videos in question. It is our hope that Vimeo can be restored promptly in India. Pastebin is still blocked in India. We are getting many reports about this. The Indian government has blocked us, and right now there is little we can do about it. It has happened in the past, and we got unblocked after some time. If it is for good reason,let it be.But the miscreants will adopt short-cuts. Looks like the block is due to copyright violation, too. But not sure.